Last week I baked these delicious cookies. The recipe uses bits of leftover ingredients from Thanksgiving dinner. I mixed up the cookies before the big day so I used new cans of pumpkin pie mix and cranberry sauce. (See quick tip below) Because the recipe is copyright I can’t include it in the post, but I can give you the link. The recipe as written in ‘Taste of Home’ magazine can be found here: Day After Thanksgiving Cookies. I made quite a few changes to the recipe. I prefer baking and eating smaller cookies. The changes I made allow for a shorter baking time. I will leave out the white baking chips next time. They don’t add much flavor, are not real chocolate, and don’t soften when baking. They are distracting when you bite into the soft cookie. I used mini-chocolate chips instead of large and was very happy with the result. I preheated the oven to 375 degrees instead of the 350, and dropped the cookie by teaspoons onto the baking sheet instead of by tablespoon. I prefer smaller-sized cookies. I baked them for twelve minutes. 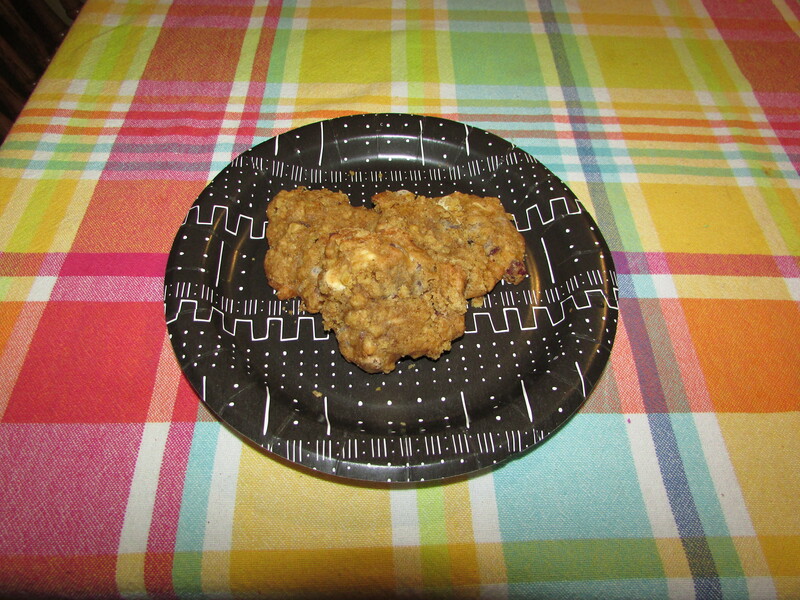 My husband, son, and grandsons loved these cookies. Honestly, I think I must have eaten half a dozen when they came out of the oven…they are that good when warm. I love cookies that are filled with ingredients that are good for you. These cookies are loaded with three good-for-you ingredients: pumpkin, oatmeal and cranberry sauce. I had one problem with the cookies: storage. The baked cookies are super-moist and stick together in one large clump if stored in a ziplock bag or on a plate. Next time I will freeze them individually on parchment paper before storing. The cookies thaw in minutes and this way they will last longer and stay intact. Because of their sticky exterior these cookies would not be good for a cookie sale or a Christmas exchange. Quick Tip: Freeze the leftover pumpkin pie mix and cranberry sauce in 1/4 cup dollops on parchment paper. These can be stored in the freezer and thawed out when you need them. Interesting! I think I’ll have to try it. They are very good…the grandboys loved them. I am ready for these before Thanksgiving. I couldn’t eat enough when they came out of the oven. I really had to force myself to stop. They are delicious. I love the name and they sound delicious. Leftover cookies is a great idea. And glad you made and enjoyed them. I like my cookies( biscuits we call them hard) but chewy is a texture I am getting used to being with American people around me.